USDA and the U.S. Coast Guard guidelines, BFI was involved in the development of the currently- approved MARPOL Annex V disposal procedures. From a single box up to tonnage volumes, BFI has the program and required permits in place to solve all your waste disposal problems, including those under APHIS. And once we take posses- sion, your hands are clean, no ifs, ands or buts. So, no matter where your ship comes in — at a major port for oceangoing vessels or at a private terminal, yacht basin or other facility — let BFI take out the garbage. Call us at p, . , 1-800-950-2010 l/j^ snipDoara for full details UJ Waste Services today. BROWNING-FERRIS INDUSTRIES ffl 1991 Browning-Ferris, Inc. All rights reserved. 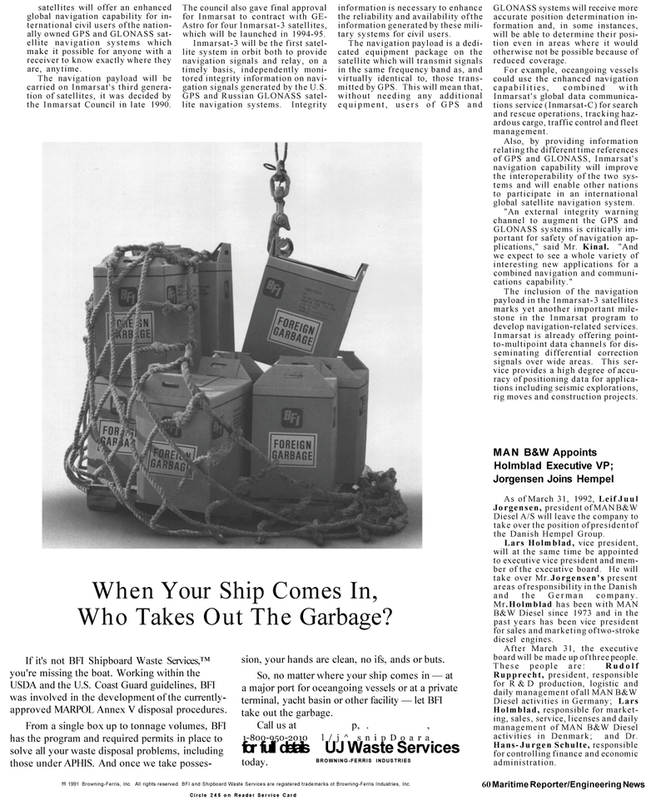 BFI and Shipboard Waste Services are registered trademarks ot Browning-Ferris Industries, Inc.
GLONASS systems will receive more accurate position determination in- formation and, in some instances, will be able to determine their posi- tion even in areas where it would otherwise not be possible because of reduced coverage. Inmarsat's global data communica- tions service (Inmarsat-C) for search and rescue operations, tracking haz- ardous cargo, traffic control and fleet management. GLONASS systems is critically im- portant for safety of navigation ap- plications," said Mr. Kinal. "And we expect to see a whole variety of interesting new applications for a combined navigation and communi- cations capability." The inclusion of the navigation payload in the Inmarsat-3 satellites marks yet another important mile- stone in the Inmarsat program to develop navigation-related services. Inmarsat is already offering point- to-multipoint data channels for dis- seminating differential correction signals over wide areas. This ser- vice provides a high degree of accu- racy of positioning data for applica- tions including seismic explorations, rig moves and construction projects. Diesel A/S will leave the company to take over the position of president of the Danish Hempel Group. Lars Holmblad, vice president, will at the same time be appointed to executive vice president and mem- ber of the executive board. He will take over Mr. Jorgensen's present areas of responsibility in the Danish and the German company. B&W Diesel since 1973 and in the past years has been vice president for sales and marketing of two-stroke diesel engines. After March 31, the executive board will be made up of three people. Holmblad, responsible for market- ing, sales, service, licenses and daily management of MAN B&W Diesel activities in Denmark; and Dr.
Hans- Jurgen Schulte, responsible for controlling finance and economic administration. 60 Maritime Reporter/Engineering News satellites will offer an enhanced global navigation capability for in- ternational civil users of the nation- ally owned GPS and GLONASS sat- ellite navigation systems which make it possible for anyone with a receiver to know exactly where they are, anytime. The navigation payload will be carried on Inmarsat's third genera- tion of satellites, it was decided by the Inmarsat Council in late 1990. Astro for four Inmarsat-3 satellites, which will be launched in 1994-95. Inmarsat-3 will be the first satel- lite system in orbit both to provide navigation signals and relay, on a timely basis, independently moni- tored integrity information on navi- gation signals generated by the U.S.
GPS and Russian GLONASS satel- lite navigation systems. Integrity information is necessary to enhance the reliability and availability of the information generated by these mili- tary systems for civil users.